Gee, found no history-of-the-band relating to this Keyport based New Jersey Prog/ Technical Metal outfit, consisting of guitarist/ singer Matt Lupo (whom appears to be the only remaining original member); guitarist/ melodic singer Greg Kuter, guitarist Ray Suhy (the latter two the latest additions), bassist/ scream singer Chris Alfano (formerly the band's bassist; also active in the band Argonauts), and drummer Seth Rheam (also active with El Drugstone)...so I'll just have to put something together from bits and pieces taken from several info sources! EotW first let itself be heard of through the self-release of a self-titled EP, in 2006. Two years later, with a line-up comprising the foursome of Lupo, bassist/ singer Brett Bamberger, guitarist/ singer Kevin Conway, and drummer Mike Somers, the band issued the debut full-length Farmer's Almanac through the Forgotten Empire imprint (the album was re-issued in April of last on limited edition LP by Nefarious Industries). 2009 saw the band again return, this time for a split with Rosetta (which we recently encountered for a review already posted) and Year Of No Light, issued through the labels Denovali, Vega Vinyl and Transition Loss. The band then signed to the latter, and returned with the full-length Ressentiment in 2010. Now, if I understand correctly, up until then vocals had only been a minor part (say even non-existing) in EotW's music, but as of Ressentiment, that part of the music grew more and more important, and even more so on Ressentiment's follow-up, October 2011's The Apologist, on which Lupo did his first, albeit still few, vocal endeavours. In order to promote its 3rd album (for which a double LP version was also issued through Antithetic Records), the band went on a (self-organized) month-long US tour in late October 2011, and followed that up with another month's tour (for the band it was a first one organized by a booking agent) with Black Tusk in March & April 2012. Oh wait...it would seem that the above mentioned line-up of the Farmer's Almanac album lasted until somewhere in 2012. With the addition of melodic singer/ guitarist Greg Kuter (his vocal parts being relatively important), EofW have apparently given yet another twist to their music, besides adding an additional layer of guitar with Ray Suhy (also guitarist for The Baltic Sea, he joined EotW after Conway's departure in April of 2012, but had already been part of the live line-up before; Bamberger left shortly after Conway, to join Revocation full-time), but...before the band could, as they had planned, return to NYC-based studio Translator Radio (where bands such as Keelhaul, Unsane, Pelican, Cave-in and Rosetta had recorded some of their earlier albums) to record new material, hurricane Sandy blasted over the East Coast, destroying the studio in the passing. In order to support the studio's re-build, EotW released a demo recording for the track “I'm Always Fighting Drago” (now on the current album) with the addition of a new version of the band's debut album track “Century Of Excellence” (an acoustic version with vocal addition by Larry Chiswick of Vehicle For Blackness, ex-All Parallels repute), streamed it at their website, and offered it for download at $3 (minimum) through their BandCamp site. The band was back in the studio in late Spring, but road-tested their new material through a short North-eastern American tour in April of last. Just prior to that tour however, the guys upped their offer to support Translator Radio, by adding 2 free downloads to their original offer (the first in the form of the Personnel EP by Lupo's side-project Opul; the second the full-length Understanding Consequences by Day Without Dawn, the short-lived act formed by members of EotW in 2006, after their former band The Postman Syndrome had folded). The band entered New Brunswick's Trax East late in May with engineer Eric Rachel (whom in the past worked with the likes of Burnt By The Sun, God Forbid, The Red Chord, Skid Row and Municipal Waste, among others), with additional work done by Todd Hutchman (known from Zud and The Baltic Sea) at Acacia Recording, and mixed by Rachel at Trax East. As mentioned somewhere in the heap of info I assembled for this review, “...Featuring a revamped line-up, the nearly fifty-five minute Redaction Artifact counters some of EotW's most direct and aggressive musical attacks with their most melodious vocal and guitar harmonies to date...” and, quite frankly, the variety and changing moods on the album make the job of reviewing such an album rather difficult. However, it is one of those albums which the seasoned listener can listen to time and time again, discovering more elements and undercurrents with each session...and that makes the album worth-while, really! For some music by the band, check (www.) 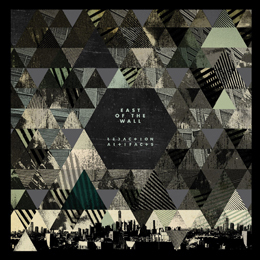 eastofthewall.com, where you'll find older music by the band in the “Music” section, and music off the new album in the “News” section (a video for the track “Obfuscator Dye” - see post Nov. 20; audio for the track “The Fractal Canopy” - showcasing the more melodic side of the band, posted Oct. 23; music clip for “Arbiters Meet” - posted Oct. 15; and the above mentioned demo for “I'm Always Fighting Drago” - posted Feb. 26)! Yep folks...this is year-list material alright!